Just 35 years after Jamestown was settled, Virginia colonists planted tobacco in nearby Middlesex County, an area strategically located between two major rivers and the Chesapeake Bay. 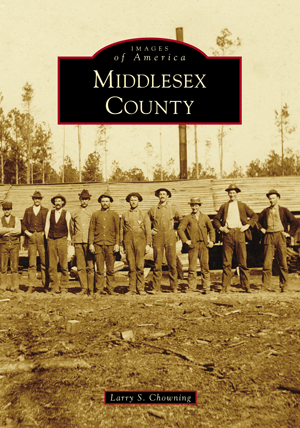 Middlesex life has been closely tied to both land and water. From the commerce of the early steamboats to the modern oyster-farming industry, the waterways have provided an avenue for business and a bountiful harvest of crabs, fish, and oysters. The county's modern boating industry grew from a 19th-century wooden boatbuilding tradition. The center of that industry, Deltaville, is known today as the "Boating Capital of the Chesapeake Bay." From the county's oyster heritage came Virginia's most famous celebration, the Urbanna Oyster Festival, which annually draws 60,000 people to the small waterfront town. Stately homes and churches that predate the Revolutionary War include Colonial Christ Church, which annually attracts hundreds of marines to the gravesite of Lt. Gen. Lewis Burwell "Chesty" Puller, the most decorated marine in the history of the United States Marine Corps, who retired to the county in 1955. Larry S. Chowning, author of 10 books, is a native of Middlesex County. He has lived there his entire life with the exception of the four years he spent at the University of Richmond. Chowning is a staff reporter for the Southside Sentinel, the county’s weekly newspaper.